Check out the first chapter of Breaking Without You! Did you see the first chapter of Breaking Without You (Fractured Connections Book 1)? I adore this story and cannot wait to share it with you! And don’t miss Shouldn’t Have You (Book 2), Falling With You (Book 3), and Taken With You (Book 4) out soon! Ink By Numbers in Audio! I’m thrilled to show off Kaylee and Landon’s romance, Ink By Numbers! NOW OUT IN AUDIO! This is a bonus romance in the Montgomery Ink: Colorado Springs series and it a perfect way to spend your afternoon! Kaylee knows art, friendship, and love. And because she’s known love, she wants nothing to do with it ever again. She likes her life just the way it is. Her art and her Brushes with Lushes classes keep her sane and happy. Landon spends his days with numbers and financial spreadsheets. At night, he just wants to relax, but the only way he can do that is with a woman. But these days, not just any woman will do. Kaylee and Landon do an excellent job of dancing around each other, but no matter how much desire burns between them or their own personal hang-ups, they’ll need to make a choice: life as they know it, or a life that could be so much more. Author Note: Ink by Numbers is a Montgomery Ink short story and a little different than what you’re used to from me. It’s shorter than my other novellas at only ~15,000 words. It has a complete HEA, and is perfect for a steamy evening, one-sitting read. NOOK has a special BOGO offer on three of my books this week. That means Jagged Ink, Whiskey Undone, and Forever Broken are part of a huge Buy One Get One Free deal! Did you know Carrie Ann has an entire merchandise store for her bestselling series? 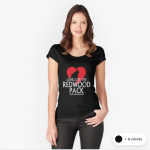 Head on over and pick up things such as a Long Live the Redwood Pack shirt, mug, or phone case! Did you know Carrie Ann has an entire merchandise store for her bestselling series? 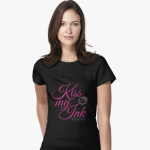 Head on over and pick up things such as her Kiss My Ink shirt! Carrie Ann's newsletter is for big announcments, like book releases, while site news keeps you up to date with everything going on in the world of Carrie Ann. Sign up for whichever kind of news you want, or both!